This Blog would like to draw your attention to a unique place in Sussex to enjoy some real ale and a homemade curry on a lovely summer’s evening - The Observatory Science Centre at Herstmonceux, Saturday 20th June from 7.30pm-midnight. In 1990 The Royal Greenwich Observatory closed its doors at Herstmonceux and moved to Cambridge, leaving the historic telescopes behind. Five years later the Equatorial Group came back to life as The Observatory Science Centre, under the aegis of Science Projects. An extensive programme of repair and upgrading of the buildings and telescopes was completed in 2004 with the aid of a substantial grant from the National Heritage Lottery Fund. It is now a Grade II* listed monument. 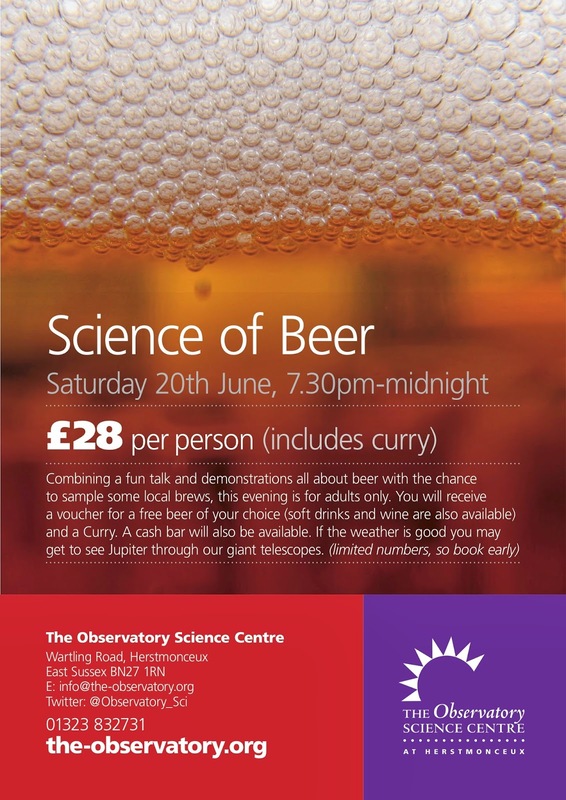 Along side the historic telescopes there are over 100 interactive hands-on exhibits and exhibitions all available on our Science of Beer evening. This Science of Beer evening is for adults only and will combine a fascinating talk with some fabulous fun demonstrations all about the process of brewing beer with the chance to sample some local brew! All this plus a curry AND a voucher to sample a free beer of your choice (soft drinks and wine are also available). Vegetarian options are available but we are unable to offer alternatives to the curry. If the weather is good then there will also be an opportunity to look through the Centre's fantastic historic telescopes at some fascinating night sky objects including VENUS, JUPITER and even SATURN! There will be an opportunity to buy other beers from the brewers but please bring cash with you as credit card transactions will not be available.